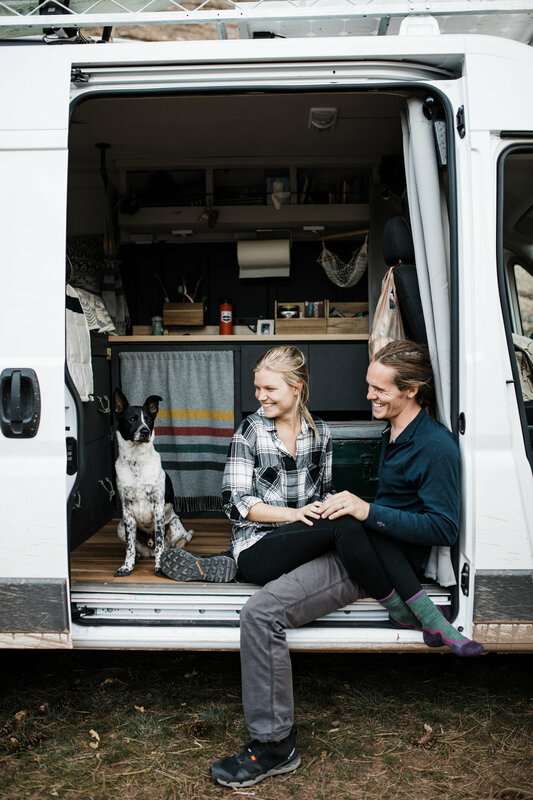 - Before planning our own details, I looked through a few vans for inspiration and one thing that stood out to me was every van seemed to go with a "bright + airy" all-white-everything color scheme. Which I totally understand because it makes things feel bigger, more like a home and less like a cave (vehicle). - That being said, I knew I wanted to try a different route. I quickly decided the "center piece" would be our beloved wool Pendleton Blanket that we got as a wedding gift (thank you Uncle Bobby and Aunt Cindy!!!). What I've always loved about the blanket is the blue/gray colors with a hint of brown, and thankfully we already had pillows to go with it. 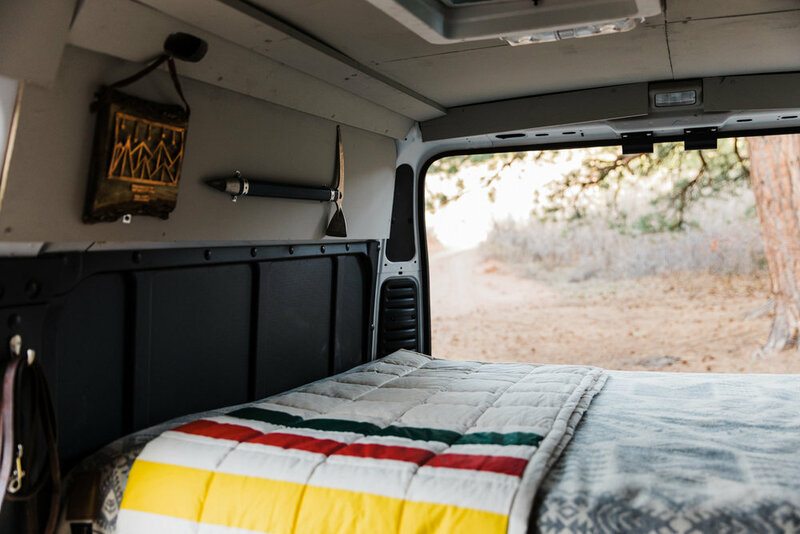 - Sticking with the Pendleton-Cabin-Vibe, I decided to use a classic Pendleton print, the Glacier/Hudson Bay stripes as inspiration for other details. I ended up finding a blanket remnant (meaning someone had used part of it and was selling the remainder) on Ebay and ordered that for the sink curtains. - The van build conveniently overlapped my birthday, so we asked for a few significant items for gifts from our parents. We're super thankful for our wonderful mattress from Callen's parents and warm down blanket from my parents!! They rock. So, the down blanket was another Glacier/Hudson Bay stripe piece, which I feel like ties into the curtains really well. - We went with cheap-o black out curtains for behind the seats since they'd definitely get dirty and we just wanted to prioritize function, but the gray goes nicely with everything so that was a win! - The thing I struggled with most was paint colors. 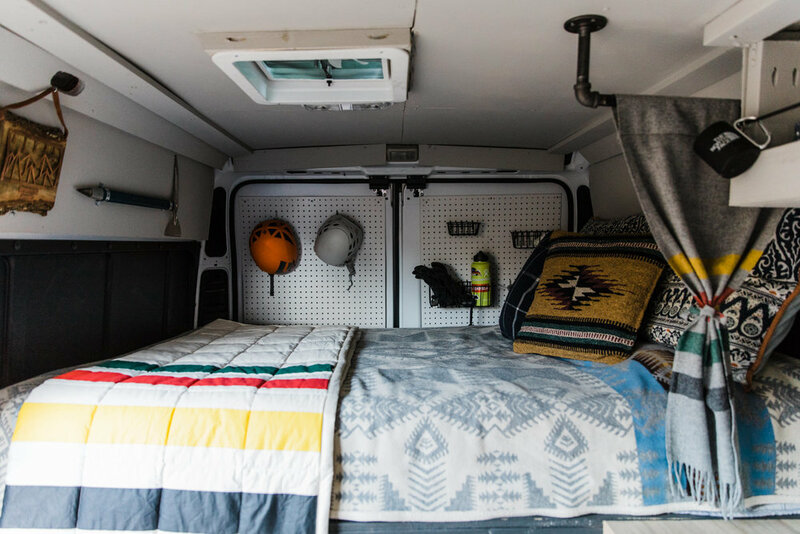 The van came with plastic black panels for the walls (backsplash, headboard, footboard) and while I love their function, I was worried about tying it all together to not look super utilitarian. I ended up searching "black walls" on pinterest to see what kind of flooring, cabinets, and countertops looked nice with dark walls and it was super helpful! Here is the primary inspiration photo I used. We ended up getting a light-ish gray tinted countertop that looks like butcher block from Ikea, painting the cabinets a matte dark gray (knowing it would get scuffed), and going with a lighter gray ceiling to avoid a total cave vibe. For flooring, we did a natural wood-looking laminate, again knowing it would get scuffed up. 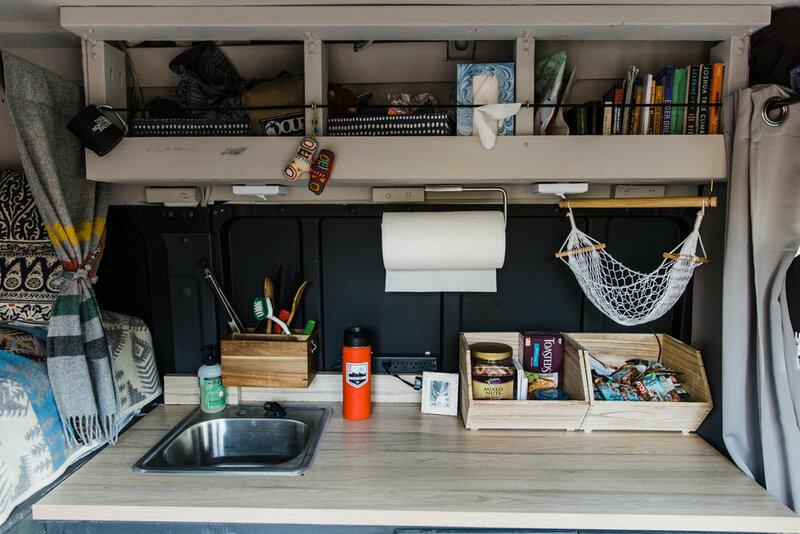 - The rest of the details were pretty simple, a fruit hammock and paper towel rack from amazon, pegboard for the back doors (pegboard baskets from amazon), wooden countertop baskets from target, and a final gem, a green trunk from Roundtop Vintage Market in Texas. The green in the trunk matches the green in the Pendleton stripe pattern, and we had enough blanket remnant left over to make a little cushion. It's become Charlie's favorite spot to sleep when we're all hanging out in the back! Overall, we're so happy with how it turned out. I can't think of anything we'd do differently. Three weeks in, the floor is scuffed, the cabinets and drawers have marks on them, and it is all perfectly lived in. I love not being worried about ruining anything because after all, it's an adventure vehicle! The fact that we can stand up and place things on a countertop is luxury enough for me. Plus - everything is so easy to clean because it's so small! As always, let us know if you have any questions. We are happy to answer them in the comments or via e-mail.